April | 2015 | ride. travel. live. 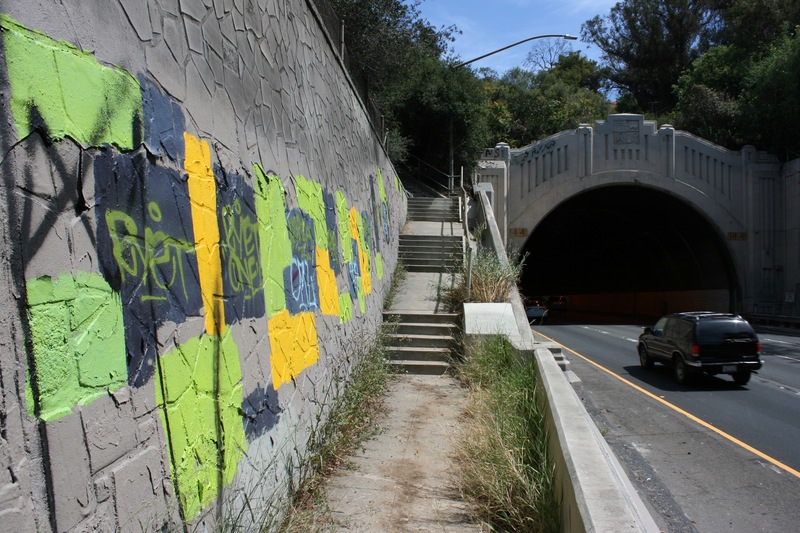 This is one of the strangest, thrilling walks in Los Angeles, a sidewalk that is sandwiched between the northbound (lower) and southbound (upper) lanes of the Pasadena Freeway (CA-110) as it tunnels through Elysian Park and crosses the Los Angeles River. Rarely used and hard to access, it has a certain element of creepiness to it, and a real feeling of discovery. The freeway and tunnels are Art Deco in style. Originally the four tunnels, completed between 1931-1935, were part of Figueroa Street as it exited north from downtown, and the sidewalks were on the sides of the tunnels. 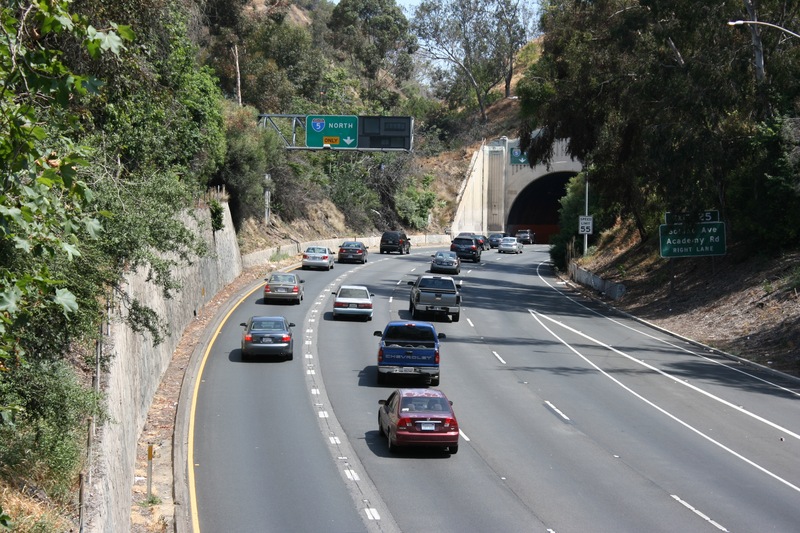 The tunnels were converted into the Pasadena Freeway, and then the southbound lanes were completed in late 1943. A connector with I-5 was finished in the late 1950s. 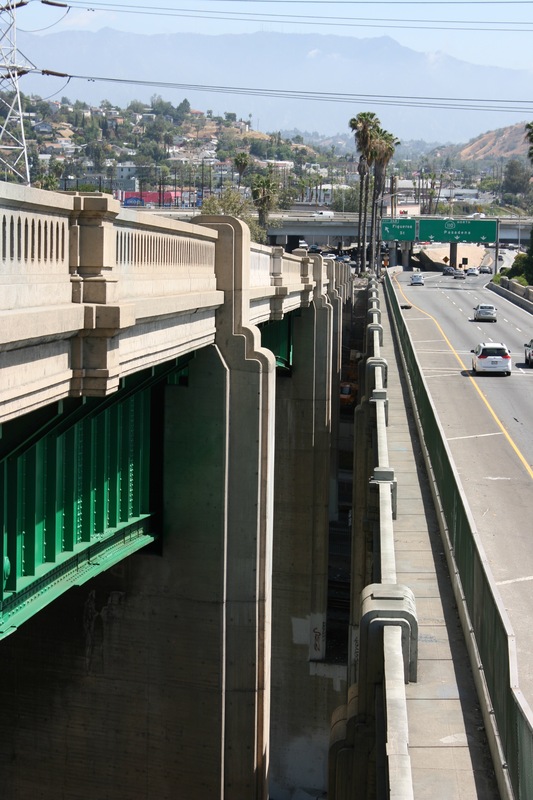 The Pasadena Freeway, or Arroyo Seco Parkway as it’s sometimes called, is architecturally distinguished, but was engineered for 40 mph, and not the 60+ mph that motorists typically drive. The on and off-ramps are very tight and hazardous, and the freeway also split the Solano Canyon neighborhood, north of downtown, in half. Southern access at Stadium Way (just past the left edge of the photo). Solano Avenue access, take this stairway from the elementary school up to the sidewalk. As for the walkway, it’s accessed from the south at Stadium Way, just past the freeway overpass. There are two access points off of Amador Street and Solano Avenue near the elementary school (one requires squeezing in through a hold in the fence), and finally a stairway at the northern end that connects to San Fernando Road. Traffic is literally on the other side of a chain link fence, and there are various social trails and homeless camps above the tunnels. I don’t exactly recommend walking this alone, or at night. I walked this twice, and had it all to myself the first time, and saw 4 people the second time. 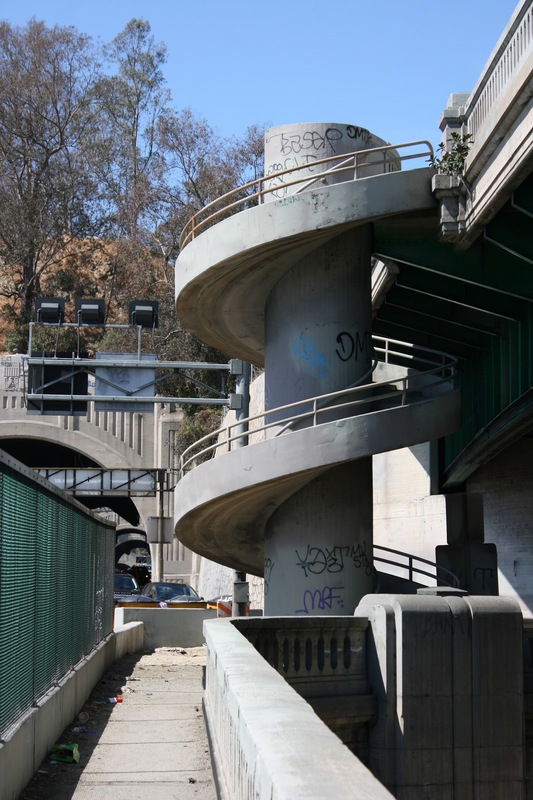 The northern end is highlighted by a spiral staircase on the south side of the LA River, which must surprise northbound drivers seeing pedestrians walking along the freeway. 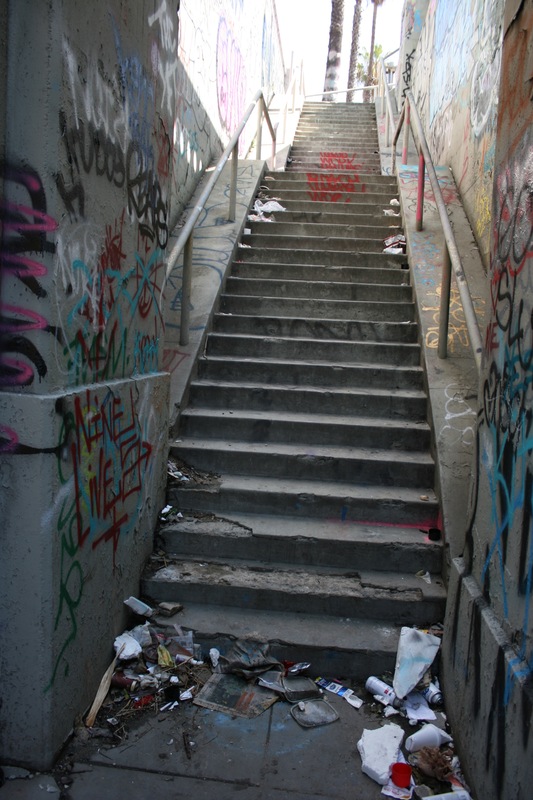 The north stairway is really grungy, liberally sprinkled with broken glass, construction debris, and a lot of garbage. The whole walkway is noisy, dirty, and not exactly peaceful, but must rank as one of the weirdest walks in the city. View from the top of the spiral staircase, looking north. Spiral stairway linking the upper and lower level at the I-5 interchange (south of the LA River).